NEWTON — In the final moments of the fencing match, the young men in white sat in folding chairs and shouted, “Ty-ler, Ty-ler.’’ The object of their cheers, Tyler Terrasi, looked nervous as he pulled on his black mask and picked up his weapon, a slender metal foil. His opponent, Collier Sims, stood tall and perfectly still, ready to duel. And with that, the first known fencing competition among blind students ended yesterday with Sims, 24, from The Carroll Center for the Blind in Newton, the champion. Terrasi, a 20-year-old student at the Perkins School for the Blind in Watertown, won the sec ond-place trophy. Sims, who came to the Carroll Center in January from her Oklahoma City home, lost much of her vision three years ago after a brain injury. To make the competition fair, she and other Carroll students who have some sight slipped on blindfolds before they attached their masks. The competition was the brainchild of Morales, who has taught fencing at Carroll for three years and now, starting this year, at Perkins. Standard fencing rules were modified only slightly for the event. First, the blind fencers began every match with their weapons touching, giving them a chance to orient themselves and figure out the position of their opponent. And second, any contact with an opponent’s upper body counted as a point. Usually an opponent’s arms are not considered targets under fencing rules. The Carroll Center has been teaching fencing to its clients since 1954, when Thomas J. Carroll founded the country’s first civilian residential rehabilitation program for the newly blind. Perkins is new to the sport. “We use it to develop orientation skills for people who just lost their vision,’’ said Rabih Dow, Carroll’s director of rehabilitation services and international training. Carroll clients are generally people born with sight who later lost their vision. That gives them an advantage because it is easier for them to walk in a straight line and therefore advance at their fencing opponent more effectively. 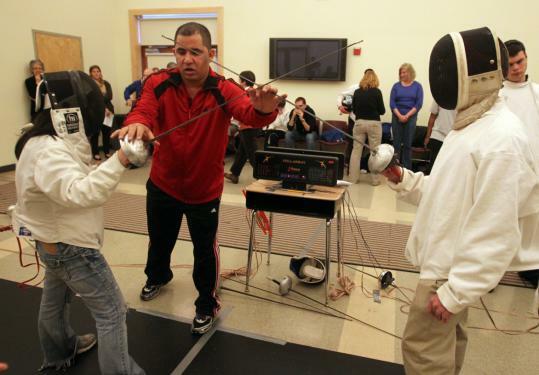 Morales says the techniques his blind students learn for getting around can also help them with fencing. Just as they use a white cane to help navigate, they can use their foil to give them information about their opponent. Learning how to advance with their weapon helps them learn about orienting their body, he said. “In fencing, everything is done with the point of the weapon,’’ he said. Morales, who came to the United States from Cuba in 1995, runs his own studio, now based at Pine Manor College in Chestnut Hill. Until recently, he was head coach at the Boston Fencing Club. Yesterday, Terrasi, the Perkins student, was happy to place second. But he conceded that he couldn’t react quickly enough to Sims’ advances. Cory Kadlik, 19, a Perkins student from Medway, has fenced for only 10 weeks. But he was intrigued by the sport and hopes to continue practicing. For him, the biggest difficulty is advancing directly toward his opponent. Kadlik thinks fencing for the blind has so much promise that he hopes other teams will form in the wake of the Perkins-Carroll competition. He won’t be fencing for Perkins next year, though. He will return to his local public high school, which doesn’t have a fencing team.